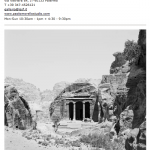 The oldest settlements in the area of Petra were inhabited by the Edomites – who were mentioned in the Book of Exodus – between the end of the VIII century and the beginning of the VII century BC. The town flourished a little later on thanks to the Nabataeans, an Arab nomadic tribe. 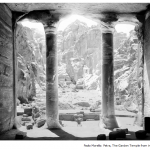 In the first half of the II century BC the Nabataeans gave life to their kingdom, establishing in Petra their capital. Its ascent was mainly due to three different factors: the orography, which made it unconquerable, the abundance of water, and, most of all, the location. For several centuries Petra was the crossroads of the caravan routes from Aqaba and Yemen to Damascus and to Constantinople, which is to say, to all of the trade routes leading to a variety of goods – spices, incense, perfumes, and tar – from India to the Mediterranean countries and from Egypt to Persia. The first king of the Nabataeans of whom we have recorded evidence was ‘Ubayda I (known also as Obodas I), who ruled from 96 BC to 85 BC. After his death, he was worshiped as a god, and the most sumptuous grave in Petra was very likely dedicated to him, the so called al-Deir (the Monastery). Around 80 BC, the Nabataeans conquered the Seleucid territories, extending their domain northward as far as the Euphrates river and Palmyra. The son of ‘Ubayda I, al-Harith III (Areta III), expanded their kingdom further, all the way to Damascus. The other famous grave in Petra, al-Khazneh (the Treasury), which owes its name to the mistaken belief that the treasure of an Egyptian Pharaoh was hidden in it, is most likely dedicated to al-Harith III. Al-Harith’s greatest success was the agreement he negotiated with the Romans: by paying a huge toll in silver, the Nabataean kingdom ensured its substantial independence. Petra grew in power and wealth from 9 BC to 40 AD under king al-Harith IV, when its population reached about 30,000 people. Toward the end of the I century AD, the Romans shifted their trade routes to Egypt and along the Nile river; new towns became pivotal along the caravan routes, such as Bosra and Palmyra in Syria. In 106 AD the Nabataean kingdom was peacefully taken over by Rome. Bosra became the new capital of the Roman province called Arabia Petræa and from then on, Petra’s slow decline began.